Bake whole trevally with a stuffing of crumbs and shellfish meat, such as crab, and cook in citrus juices, fresh dill, parsley and chives. Because of its dry flesh, marinate before cooking or serve with a sauce. The flesh softens considerably after freezing and thawing so fresh trevally is far preferable. 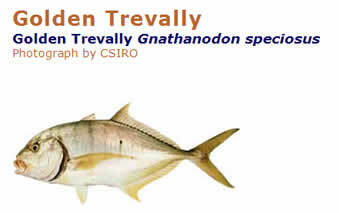 Price Trevallies are low- to medium-priced finfish. With smoked golden or silver trevally, where the flavours have concentrated through drying and the infusion of smoke aromas has taken place, choose a wine with a high level of acidity to combat the oiliness and substantial flavours. Select from some flavour-laden chardonnays or young, cool climate rieslings. Data presented are for silver trevally.